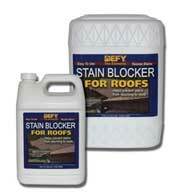 DEFY Stain Blocker for Roofs is an effective way to block many stains from reoccurring. It helps maintain the appearance of recently cleaned asphalt roof shingles, tile roofs, cedar roofs, and more. Once the roof has been properly cleaned and rinsed it should be treated with DEFY Stain Blocker. Maintenance coats should be re-applied about every 2-3 years or at the first sign of the stains return. This product is also effective on nearly any exterior painted or unpainted hard surface once stains have been removed. This milky white liquid treatment dries to a clear natural look. Simply spray on cleaned asphalt shingle roofs to form an invisible barrier that blocks the return of unsightly roof stains. Maintenance coats of Stain Blocker for Roofs can be re-applied every 2-3 years or at the first sign of stain return to help block further staining. DEFY Stain Blocker for Roofs contains no acids, caustics, or bleaches and will not harm plants when used as directed. DEFY Stain Blocker is the second step in a 2 step system to clean and protect your roof. For step 1 Roof Cleaning please click here. Free Shipping on al 5 Gallon Pails!